After passing the Kiel-Kanal, Fred should be handed over to me by Ralf, who is Pilot in the Kiel Kanal. But of course Fred has his own plans. Since he is qualified to act as a zodiac driver, he insisted to drive ashore with his own Zodiac. 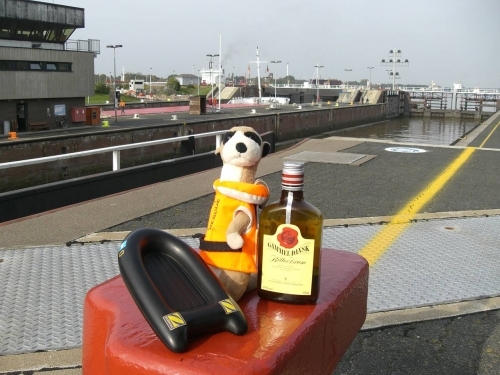 I picked Fred up at the locks in Brunsbüttel - but he was drinking !! Fred asured, that he never drinks and drives. This is essential for ones own life, he explained to me. 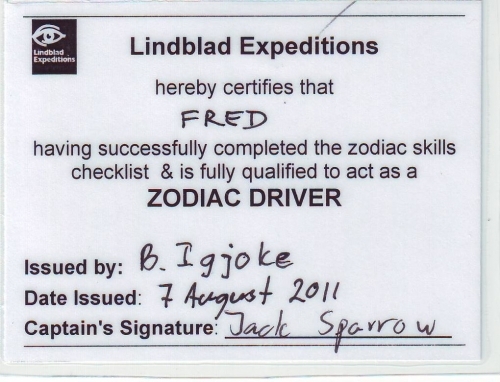 He proudly showed me his Zodiac-licence, issued by B.igjoke and signed by Capt. Jack Sparrow.